J Crew's classic pave link bracelet (retail price, $125) has been spotted on the arm of every blogger recently, and no wonder - it is gorgeous! I spotted this ILY Couture Basilissa pave bracelet a couple of months ago (retail price $75) and snatched one up for myself, as well as one lucky Look 4 Less reader! 2. Comment below with your name/email address to be entered to win. One entry per person please, multiple entries will be deleted. That's it! Pretty simple, right? Entries will be accepted until Wednesday, September 19th at noon CST. The winner will be chosen by random.org and will be contacted via email. Good luck! Note: This giveaway is not sponsored or affiliated in any way with ILY Couture. I purchased this bracelet on my own to give away to a reader. Love this beauty! I've been lusting after the jcrew version for a while now, it's a perfect statement piece! Ooh! I've been wanting one of these! Thanks for the giveaway! I have always loved this bracelet! Great giveaway! Ohh!! I LOVE LOVE LOVE that bracelet! Totally have been eyeing that J Crew one and the ILY Couture one is a great look alike! LOVE! I've wanted that bracelet from J. Crew for so long but could never justify the cost! Love the L4L. I love, Love, LOVE that bracelet. I hope I win! Gorgeous and so on trend! Tried this on at JCrew - looks amazing next to my MK resin horn watch. Was a little pricey, so I love that you found a Look 4 Less! Love, love, love the jcrew bracelet and it is on my Xmas wish list but if I can win this one, even better. Wow, thanks! How nice of you! LOVE this! I have been wanting it from J.Crew for awhile! Obsessed with link bracelets lately! This one is Gorgeous. I have an Ily Couture Necklace and LOVE it. What a nice giveaway, LOVE that bracelet! My goodness, that bracelet is gorgeous!!! Thanks for the chance to win this. Beautiful bracelet! OMG the ILY Couture one looks better than the JCrew one! Go figure! i am a resident of the us and i am a follower and i love this bracelet! I would absolutely love winning this!!! Absolutely gorgeous! I would be thrilled to win! ahh want to win this so bad! 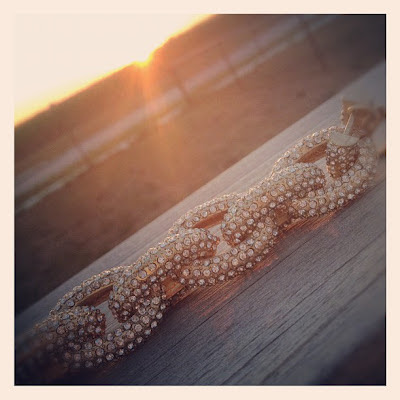 Love this bracelet, I've been drooling over it on every fashion blog I see! I was just looking at this over the weekend and thought about getting it because of its simarity to the J. Crew version. Gorgeous, it looks just like the one from J.Crew! Luv the bracelet! Thanks for the chance to win! I would absolutely adore this bracelet! Such a gorgeous bracelet thats on my wish list! Gorgeous! (Sorry, I thought that blogger linked to me email, but apparently not.) cathy (dot) y (dot) sweet at gmail (dot) com. Thanks for the chance! Beautiful bracelet! I've been eyeing the Jcrew version. Definitely a piece that will stand the test of time! I love this bracelet! Great giveaway. I love this bracelet- gorgeous! Love your blog!! Thanks for all the great ideas. Would love to win the bracelet. Love love love the gold!!!! great look-a-like! I would love to go crazy stacking a bunch of pretty bracelets with this beauty! This is absolutely adorable and I would love to win it. Ah! This is so pretty! I've had my eye on one of these bracelets for MONTHS! So pretty! Hannahbananaxp(at)gmail(dot)com! Thanks for the giveaway! I was going to email you and ask if you could find a look for less of this bracelet! You rock! LOVE this bracelet and desperately need new arm candy. Thanks for the post! This bracelet would fit right in on my wrist!! Lusting for a new bracelet! Oooh, I just love this bracelet!